There are many opportunities for major donor recognition as we develop the facilities and exhibits of the exciting new museum at the Willow Run Bomber Plant. The new home of the Yankee Air Museum will be the only un-demolished portion of the former Ford Willow Run Bomber plant. The areas of the plant that have been preserved to become the Museum’s new home total 144,000 square feet, and include the iconic 150 foot-wide doors through which more than 8,600 bombers left the plant to play their role in winning World War II. The historic Willow Run Bomber Plant, with your help, will become the permanent home of the Yankee Air Museum, reuniting all of the Museum's flyable historic aircraft with ground-based exhibits and programs at a single site. As commitments are obtained, architectural, engineering and exhibit design professionals will turn the Museum concept outlined here into buildable plans. As that process goes forward, additional giving and recognition opportunities will be developed including smaller exhibits and the sponsorship of individual aircraft. These opportunities are one-of-a-kind and are available for permanent recognition, or 10 or 20 year periods. But, before the design process can go too far, sufficient donor commitments must be secured. Giving and recognition opportunities are offered for individual or corporate sponsorship. To inquire, please contact the Yankee Air Museum Foundation. The Michigan Aerospace Foundation (MAF) is the sister organization to the Yankee Air Museum. Our purpose is to plan and fund future expansion of the Museum's facilities. Currently the MAF is involved in saving and preserving a portion of the Willow Run Bomber Plant as the future new home of the Yankee Air Museum. 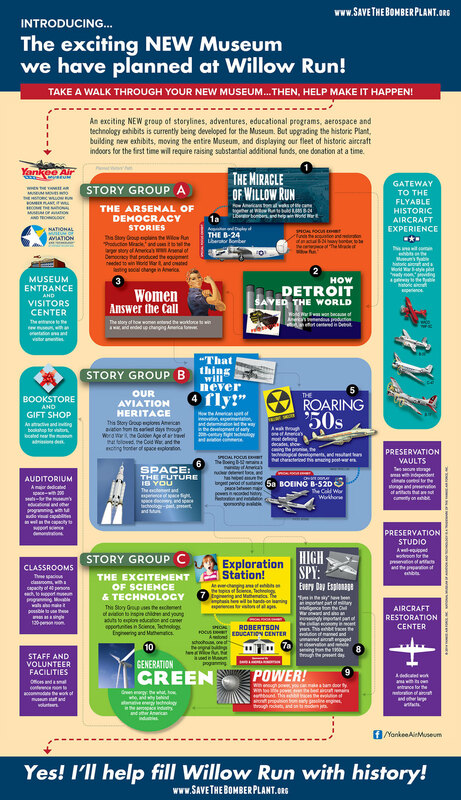 National Geographic TV segment on the historical significance of the Willow Run Bomber Plant, and the Yankee Air Museum's campaign to save a part of it. All content copyright 2018 by the Yankee Air Museum Foundation.